The go! Travel South Africa app is a comprehensive map-based source of South African tourism information and a tool for finding and booking accommodation, restaurant meals and events. The app incorporates content – displayed as pins on a map of South Africa – from go! travel magazine, online travel guide SA-Venues.com and restaurant guide Eat Out. It is integrated with Expedia, gotravel24 and ComeDine’s online booking systems. Selecting the “Explore map” option takes you to an interactive map that allows you to select various categories, such as Activities, Places of interest, hotels, B&Bs and even Wi-Fi hotspots. These are then displayed as pins on the map, which you can tap to read more information, make a booking or plan a trip. The app includes suggested trips in each of the nine provinces and it provides the tools to plan your own trips by dropping pins for the sights and activities that pique your interest onto the trip planner timeline. (The trip-building feature is only available for the tablet versions of the app, not for the phone version.) The app also offers offline maps for finding your way around the Kgalagadi Transfrontier Park and the Kruger National Park, among others, without an Internet connection. The app recently won a silver Pixel at the 2012 Bookmarks Awards and a bronze Loerie Award. The go! 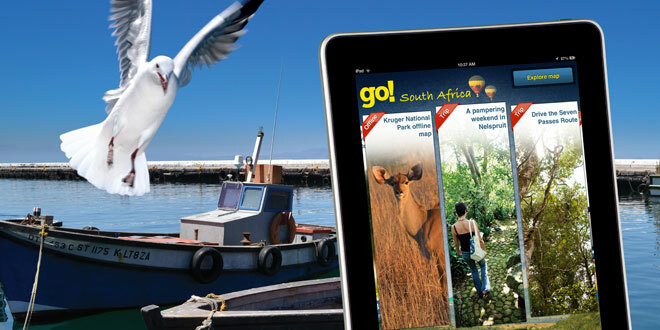 Travel South Africa app was developed by Touchlab, a division of Media24.